Red #/100, Blue #/50, Green #/10. Click here for a comprehensive PMG guide and hot list. 2012 Fleer Retro Football puts science to the test by checking to see if lightning can strike twice. 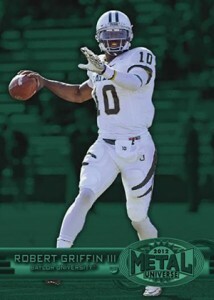 Following the runaway success of 2011-12 Fleer Retro Basketball, Upper Deck brings the concept to the gridiron. Every 20-pack box boasts a total of six autographs and four additional inserts that draw from popular sets of the 90s. The 250-card 2012 Fleer Retro Football base set is divided into four sections. It begins with 50 regular cards. Using the 1993 Fleer Rookie Sensations design as its inspiration are 100 rookie short prints that fall every second pack. 1997-98 Fleer Metal Rookies are inserted two per pack with 60 in the set. One of 40 different 1997-98 Fleer Metal Retired cards can be found in every pack. Like the base set, 2012 Fleer Retro Football autographs use several different designs. Leading the way are SkyBox Autographics designs used between 1997 and 2000. Base set Rookie Sensations have a signed parallel as do the 1960 to 1963 Fleer inserts. One of most explosive elements of 2011-12 Fleer Retro Basketball, Precious Metal Gems, transfers over to 2012 Fleer Retro Football. Like basketball, they come in three colors: Red (#/100), Blue (#/50) and Green (#/10). Several 1990s-inspired inserts are tough hits individually. However, because there are so many, combined odds are a little better. These sets include Playmakers Theatre (#/100), Flair Showcase Row 0 (#/100), Golden Touch (1:144 packs), A Cut Above (1:144 packs), Metal Championship Hardware (1:180 packs), Intimidation Nation (1:180 packs), Ultra Stars (1:180 packs), Noyz Boyz (1:240 packs), Flair Hot Hands (1:120 packs), and Jambalaya (1:360). For several of these sets, they're making their football debut. Sets like Jambalaya and Noyz Boyz have been extremely popular in the past with hoops collectors. Going further back in time are the remaining inserts in 2012 Fleer Retro Football: 1960 Fleer (1:100 packs), 1961 Fleer (1:20 packs), 1962 Fleer (1:15 packs) and 1963 Fleer (1:12 packs). purchases have driven the BK prices and they don’t buy Football. Anyone who buys this will be hammered by the UD again. 3 stars for product and bringing back fleer but no stars because of price. Like how ud used original fleer designs despite they not having a pro license it still works. Just wish they could break down each product and make them seperate for a much more reasonable price. It’s nice to see 6 autographs per box. That is a nice ratio. It will be interesting to see how this product sells. Interested to see how this plays. The 60s card designs, to me, don’t exactly have that clean look of the Upper Deck football throwbacks. When is the release date ? Checklist ? michael � I just checked a couple of retailers and am seeing both March 5 and 12 (so likely was just pushed back another week). UD normally releases the full checklists right around the time of release. NOT ONE ADRIAN PETERSON? No PMG’s, or HOt HANDS? WTF UPPERDECK!!! Just like everyone else, $$$ spendy product, had to save up for this box, but finally bought one. 6 autos is nice, but this product should’ve been more available like 2013 Topps Archives Football. All in all cool set.